Hi Guys, Grace here! As promised, here's the cocktail Casie made for our Expanse finale dinner a few weeks ago. I asked Casie to write a little something about the show and her inspiration for the recipe. Pro-tip: Get drunk and rant to your friends about a tv show they've never seen; it's the best way to get them to start watching. A couple of months ago Grace and I had just finished working on a cake and afterwards we decided to grab a drink. It was then that she told me all about this show she was watching called The Expanse. Several hundred years in the future, people have colonized the solar system. A police detective in the asteroid belt, a United Nations diplomat and a crew of ice haulers are trying stop a war between Earth, Mars and The Belt. In doing so, they discover the greatest conspiracy in human history. She talked so passionately about it (and brought it up on Twitter once or twice) I figured I had to give it a try. Once I started I was hooked and caught up just in time for the season 3 finale. Grace and I figured we should make themed items to celebrate. She went the savory route and made Alex Kamal’s lasagna and I decided to make a cocktail inspired by the premiere of season 3. In the episode, the US has declared war on the Martian Republic. Our heroes (Holden, Naomi, Amos, Alex and Prax) are flying around in a stolen Martian ship. To avoid drawing attention to themselves, Holden (the captain) decides they need a new transponder name. Prax, a botanist, suggests "Contorta" which comes from the tree "Pinus Contorta" (also known as the Lodgepole Pine). The Pinus Contorta is a fire-dependent species of tree which means that the tree has to be on fire for the pine cones to open and the seeds to be let out for it to survive. Inspired by such an interesting concept, I decided to make a cocktail with pine liquor that is set on fire for you to enjoy as a complement to your Expanse binge-watch or when the newest season premieres on Amazon next year! Pour high proof alcohol in a shallow bowl. Put the fresh rosemary sprigs in the bowl to soak. Pour gin, pine liquor, lime juice and simple syrup into cocktail shaker over ice and shake. Strain into an old fashioned or rocks style glass with ice. Top off with soda water. 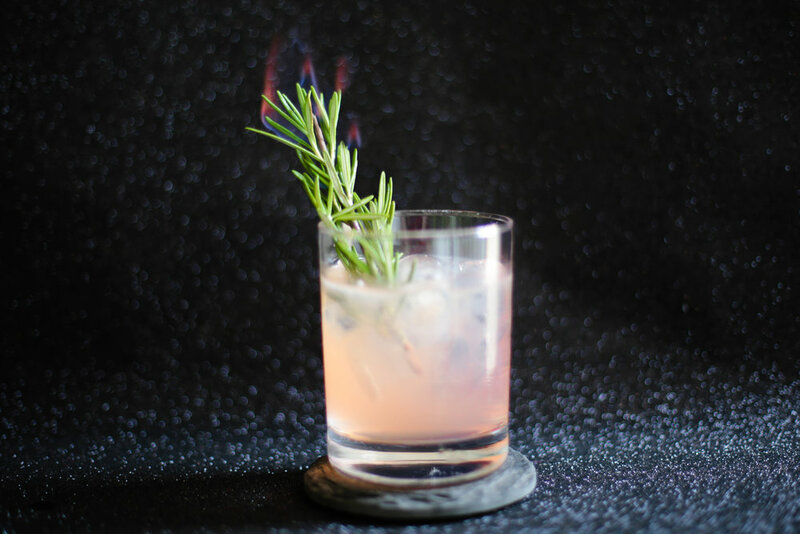 Place a sprig of rosemary in the cocktail and light the exposed part on fire. Make sure the flame is completely out before you start drinking the cocktail. Enjoy! Safety Tip: This is a strong cocktail so I recommend only lighting your first one on fire.